It would have been very easy to make Sully a straight “true events” movie. A disaster movie without the disaster. A collection of very specific, real-life events, going through what happened blow-by-blow. There is an aspect of this in Sully, and it is still very interesting, however there is also a whole other level to the movie, one that explores what it is like to be a hero. Chesley Sullenberger, the Sully of the title, became famous in 2009 when he landed a passenger plane on the Hudson river and saved the lives of all 155 people aboard. It is an incredible story and one with a very happy ending. The background to this, how it was done and how New York’s finest, including the coastguard and emergency responders, all came together to save these people’s lives would warrant it’s own movie but there is a tale behind the events. Sully is a normal person who was thrown into the limelight after one heroic act. This is not something that can be taken lightly and the movie also explores how that effects a person, including symptoms of PTSD and a subsequent investigation which may prove Sully isn’t quite as heroic as it may initially seem. At first, the “sub-plot” of this movie feels slightly pointless. You wonder if it’s really worth exploring a potentially darker side of a story which is fundamentally inspiring and incredible but as the movie and this particular story unfolds, you realise there is something worthy there and that it actually enhances the more matter-of-fact events. The actual events of the “crash” (or forced water-landing as Sully reminds the investigators) are still the centerpiece and are recreated in their heart-stopping brilliance by director Clint Eastwood. He manages to show the events without hyping the tension, over-playing the drama or making anything feel exaggerated. You feel the fear of the passengers, the slight panic of co-pilot Aaron Eckhart and the unflappable coolness of Tom Hanks’ Sully. Hanks, as you’d expect, carries the movie effortlessly. This isn’t just a man being heroic. There is a much deeper performance here and one that Hanks pulls-off with relative ease, or at least makes look easy. From panicky moments staring at a quiet New York to the recreation of the famous event itself, Hanks is everything you’ve come to expect from the veteran actor. Hanks also helps sell the final-act perfectly too. There is a great element of drama to the final moments in the investigation hearing and without resorting to Tom Cruise in A Few Good Men levels of hysterics, Hanks delivers some excellent lines which elicit goosebumps and tears in equal measure. 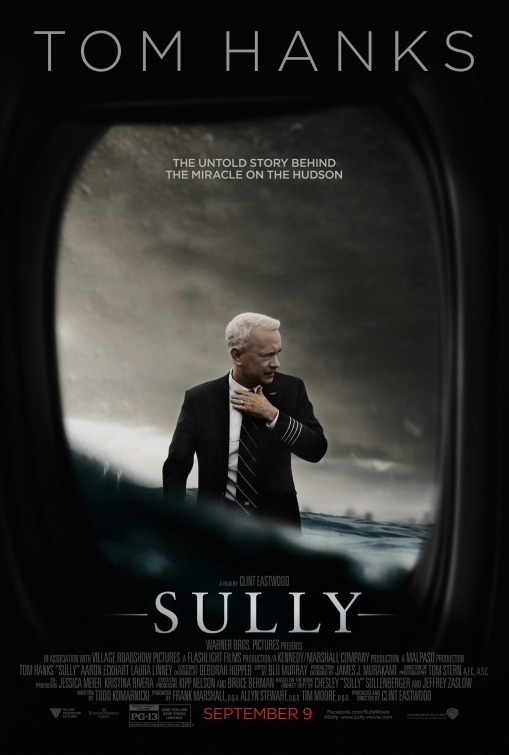 Overall, Sully is an extraordinary true story which isn’t exaggerated, over-dramatised or full of forced hyperbole. Eastwood lets the story speak for itself, while Tom Hanks delivers yet another accomplished performance which helps sell how incredible this moment in history really was. Definitely a great film worth seeing.